Lower levels of Internet usage are not uniform across different segments of the rural population. Some rural Americans use the Internet at rates comparable to their urban counterparts, but the rural-urban gap gets more pronounced for those with less education and money. The overall gap between Internet use in rural and urban areas has remained relatively consistent for the past two decades. Since 1998, rural people have used the Internet at a rate that is 6 to 9 points lower than urban residents. That consistency leaves the impression that all rural Americans share a similar connectivity disadvantage. But a new report from the National Telecommunications and Information Administration shows that there are significant differences within the rural-urban digital divide when you look below the surface at sub-groups of rural Americans. Rural college graduates, for example, use the Internet at about the same rate as urban graduates (83 and 84 percent respectively). But as education levels fall, the gap between rural and urban usage increases. Sixty-three percent of rural residents with just a high school diploma use the Internet. That’s 6 points lower than the rate for urban residents with a high school diploma. The gap was slightly larger for rural residents who did not have diploma. For that group, 52 percent of rural residents used the Internet, while 59 percent of urban residents who lacked a high school diploma used the Internet. “People with lower levels of educational attainment were even more likely to find themselves on the wrong side of the digital divide when living in a rural area,” said the report, which was based on Census and NTIA data. “Our analysis reveals that the digital divide was greatest between rural and urban users without a high school diploma,” the report said. The numbers also showed a difference in the rural/urban Internet gap based on income levels. Rural families who earned $100,000 or more a year were only 2 points less likely to use the Internet than urban residents in the same income bracket (84 percent vs. 86 percent). For rural residents earning $25,000 to less than $50,000 a year, that gap was 4 points (66 percent vs. 70 percent). The analysis also showed that rural-urban digital divide was especially pronounced for whites and blacks, while Hispanics, Asians, and Native Americans had a smaller gap. “All persons, regardless of race or ethnicity, were less likely to use the Internet when living in rural areas, but certain groups of rural residents face a particularly large digital divide,” the report said. 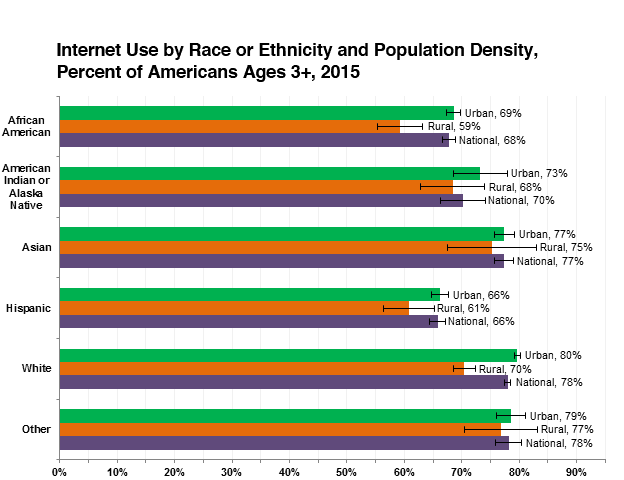 Whites and blacks in rural areas were 10 percentage points lower than their urban counterparts in Internet access. The rural-urban gap ranged from 2 to 5 points for people whose ethnic origins were Asian, Hispanic, or Native America. The report as written by Edward Carlson and Justin Goss and was released August 20, 2016.